Spritz a large nonstick skillet with oil and heat over medium-high heat. Add the mushrooms cook, stirring occasionally, until golden brown. Remove from pan. Add the spinach and 1 tablespoon water to the skillet; cook 2 minutes, or until spinach is just wilted. Remove from skillet and turn off heat. 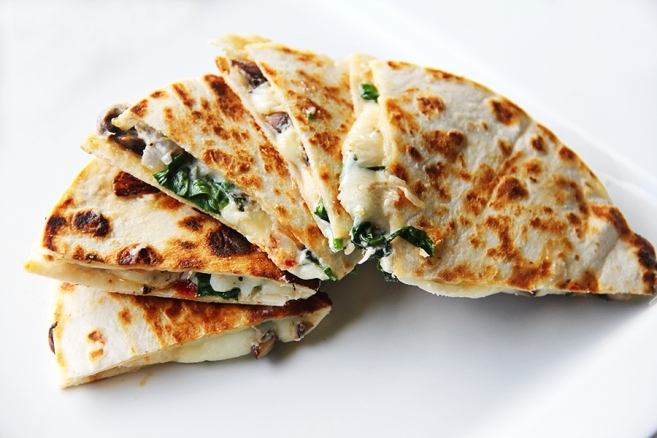 Spread a quarter of the goat cheese on each tortilla and top with mushrooms, spinach and tomato & mozzarella cheese. Lay another tortilla on top, press lightly. Heat the skillet and place the quesadillas in it; cook two minutes per side, or until golden brown and lightly crisp. Repeat.